When I was younger, I believed that James Bond lived in Switzerland and ate lots of well known Swiss chocolate. And then, after receiving that all important phone call from MI6 explaining that his country needed him, James would jump onto his skis and hurtle himself down a death defying mountain slope with a wobbly Alpine backdrop behind him. Still a huge fan of Bond today, I am eagerly anticipating the release of ‘Spectre’ on October 26. Tuxedos at the ready, for the first time ever the film will premiere on the same night that it opens in cinemas across the UK. As Daniel Craig’s fourth appearance as this legendary British symbol, he is expected to thrill us once more with his suave and sophisticated approach to saving the world. Let’s not forget his epic appearance at the opening ceremony of the 2012 Olympic Games when he jumped out of a helicopter with Her Majesty the Queen to ensure her safe arrival. There have been 23 films released to date, the first being Dr. No in 1962. It is estimated that 25% of the world’s population have seen at least one of the 23 films. This popularity and success explains why it is one of the highest grossing film series to date. So it is not surprising that several big brands invest heavily for the privilege of product placements in the James Bond brand which generates billions in revenues. 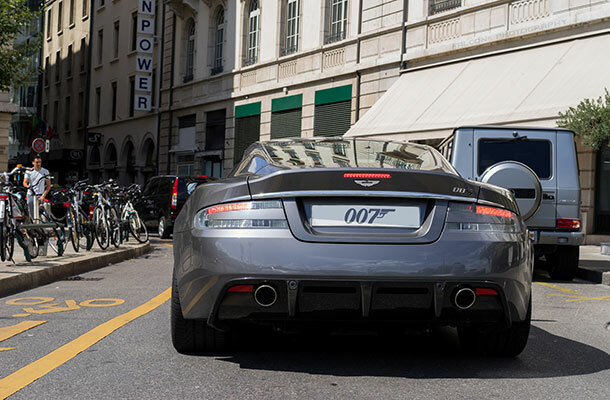 One long standing association with the Bond franchise is Aston Martin which this year celebrates its 50th anniversary. Often filmed in exotic locations all over the world, the power of this brand projects an air of quality, style and sophistication second to none. Efficient branding such as this should not be underestimated. Using clever marketing strategies, they appeal to customers, drawing them in to attract and entice. It’s because of these tactics, that I don’t mind sharing a secret of mine with you. I often find myself gazing out of the window on sunny days, imagining myself cruising around the South coast in a vintage DB5, complete with head scarf, picnic hamper and a chilled bottle of bubbly. Another fascinating aspect of the films for me is the innovative variety of exciting new gadgets. Exploding suitcases, safe cracking devices, jet packs and ejector seats to name but a few of the long list of inventions. It may surprise you that a quick patent search on Espacenet reveals no results for wrist dart guns or steel rimmed bowler hats. Yet, there were several patents for homing devices and even more for tape recorder cameras. The database is useful to check for both UK and worldwide published patent applications and registered patents. An advanced search using key words is quick and easy to do. We always recommend searching before making a new patent application to see if your invention already exists. If you are inspired to apply for a patent for your car invisibility cloak or your ski pole gun, then be sure to read our before you apply for a patent guide on our website. Applying for a patent can be a lengthy and complex process. It may be interesting to note that on average, only 6% of people who apply on their own get a granted patent. Most people who successfully apply for a patent use a patent attorney. It is important to note that you should not disclose the invention before you apply. If you do need to discuss it with a third party, we recommend the use of a non-disclosure or confidentiality agreement. For more information on patents and protecting your brand, take a look at our free online tool IP Equip and make sure you’re as equipped as Mr Bond.